Transparency Market Research has published a new report titled, “Off-road Vehicle Market - Global Industry Analysis, Size, Share, Growth, Trends, and Forecast, 2018 – 2026”. 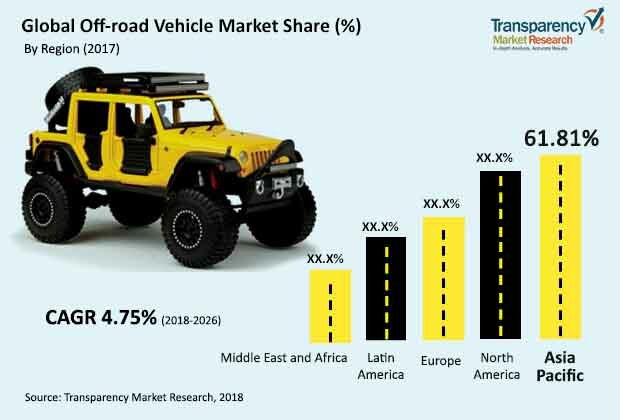 According to the report, the global off-road vehicle market for automotive is anticipated to surpass US$ 380 Bn by 2026, expanding at a CAGR of more than 4% during the forecast period. Off-road vehicles are primarily utilized in three sectors: Construction, mining, and agriculture, and all the three sectors are expanding at a significant pace; however, the off-road vehicle market is expanding significantly owing to considerable expansion of the construction industry. Moreover, expanding economies are a major factor fueling the construction industry, as economic expansion leads to high investment for the development of infrastructure of their respective economies, which in turn boosts the demand for construction equipment and machinery that hold a significant share of the off-road vehicle market. Along with rapidly expansion of the construction industry, the mining sector has witnessed considerable expansion in the last few years. It is another major industry that utilizes off-road vehicles in large numbers. Haul trucks and loaders are majorly employed equipment in the mining sector, which in turn boosts the demand for off-road vehicles. Furthermore, the major players engaged in mining are likely to undertake more aggressive efforts in order to boost their production, as demand for minerals and metals is rising consistently owing to the expansion of manufacturing industries. These efforts are likely to boost the market significantly during the forecast period. Furthermore, the agriculture sector is a major contributor to the global GDP (gross domestic product), and in 2014, it accounted for one-third of the global GDP. According to the World Bank, agricultural development is a considerably powerful tool that can be employed to beat extreme poverty. Therefore, governments of countries in most regions are taking required steps to boost their respective agriculture sector and manufacturers involved in the manufacturing of agricultural equipment are continuously developing equipment which can boost the production of the sector. Therefore, such development is likely to boost the off-road vehicle market, as most vehicles used in the agriculture sector are off-road vehicles. The off-road vehicle market is highly dependent on global economic expansion, as construction and mining sectors that utilize a major share of off-road vehicles are highly dependent on the global economic expansion. Consequently, demand for off-road vehicles in a specific region is dependent on the economic situation of that region. Thus, sluggish expansion of the economy may affect negatively the off-road vehicle market significantly due to slowdown in construction and manufacturing sectors. Based on application, the global off-road vehicle market has been classified into construction & mining and agriculture. The agriculture segment held a major share of the market owing to large volume of the agriculture equipment. Governments in most regions are focusing on the enhancement of the production of the agriculture sector and hence, provide subsidies on agricultural equipment. This, in turn, drives the agriculture segment significantly, while, most construction and mining equipment are very heavy and expensive and are manufactured in lower volumes as compared to agricultural equipment. Hence, the construction & mining segment held a minor share of the market. Furthermore, based on fuel type, the diesel segment held a major share of the market. Most off-road vehicles produce very high torque, which can be achieved easily with diesel-driven vehicles. However, some manufacturers have developed gasoline engine-driven off-road vehicles, due to stringent emission norms and gasoline is considered a cleaner fuel as compared to diesel. In terms of region, Asia Pacific is the leading region of the global off-road vehicle market, followed by Europe. Most countries in Asia Pacific are developing countries, thus the construction industry is these countries is expanding rapidly. Moreover, China and India are rapidly expanding economies, which are propelling the off-road vehicle market in the region. Asia Pacific is home to a large agriculture sector and hence, the agriculture segment holds a prominent share of the market, as compared to the other regions. Key players operating in the global off-road vehicle market include AB Volvo, Caterpillar, AGCO Corporation, Bell Equipment, CLAAS KGaA mbH, CNH Industrial N.V., Deere & Company, Doosan Infracore, Escorts Limited, Hitachi, Ltd., Komatsu America Corp., KUBOTA Corporation, Liebherr Group, Mahindra & Mahindra Ltd., Manitowoc, SAME DEUTZ-FAHR Italia S.p.A., Terex Corporation, and YANMAR CO., LTD. Among all the players, Mahindra & Mahindra Ltd. is a leading manufacturer of agricultural equipment and is notable producer of farm tractors, globally; however, the business of the company for agricultural equipment is concentrated in Asia Pacific and it is trying to expand its business units in Europe and North America.